I wear this style because society has told women of my size that two-pieces are not an option. Is that because others will see the imperfections that come with being human? And what is my imperfection? My legs jiggle when I walk. A little side to side motion. But what bothers me the most is when the bottom of my bathing suit in the front is too tight creating a bubble of fat near the top of my legs. Because of my imperfections, I put on a one-piece and tell myself, “This is what my size is supposed to wear.” And what the hell does this mean anyhow? What’s truly sick and twisted is when I’m poolside and I see a woman who is clearly bigger than I am, wearing a two-piece and I think to myself, “Wow, I could never wear that. Good for her!” I’m so body negative and I don’t even give it too much thought because I have always been that way, even though I grew up with a mother who celebrates all body types and constantly reminds me that I am beautiful. However, I look at my mom, who is painfully thin, and wish I were her, while she wishes she looked like someone else. Although body image is something I struggle with every day, sometimes I feel truly beautiful in a bathing suit and I think it’s because every so often I become lucid and love my body for what it is and what I’ve made it. But then that feeling disappears, leaving me raw and emotionally uncomfortable. 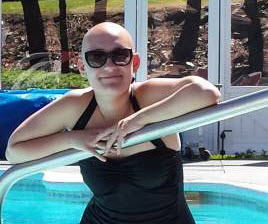 And the saddest part of all…being bald from Alopecia Areata doesn’t even make me feel different, I own that. Now if I could just accept my body. Addie Newcombe is almost 21 years old and a junior at Seattle University where she is majoring in Political Science and minoring in Nonprofit Leadership. She hopes to become a fundraiser for an organization that focuses on disease research, just like her dad. This interest of hers stems from the disease she was diagnosed with when she was eight—Alopecia Areata—a disease that attacks the hair follicles, resulting in hair loss. At the age of sixteen, five foot five, and 171.5 pounds, Addie was told by her doctor that she was at risk for Type II Diabetes and needed to be proactive about it. With the help from Weight Watchers and her mother’s support, today Addie weighs 145, but it hasn’t gotten any easier. She still struggles with body image and being thinner hasn’t solved ANYTHING. “Bathing suit Season” is her first time putting into words how she feels about herself when she has to put on the suit. She finds that writing has given her the tools she needs to start dealing with her body issues. Although she will never truly be able to eat what she wants without worrying about the “consequences”, she isn’t in denial about her twisted relationship with food and her body anymore. She loves food and that’s okay.